Details are now clear about Exeter on Saturday. Firstly, the local rag managed to get the details about the route of the EDL march totally wrong. They are NOT marching down Sidwell Street or the High Street. The EDL are assembling at The Locomotive on New North Road at 12.00 and it is our understanding that at 1.30 they will be marching north up New North Road, round to the clocktower and then up Queen Street for Rougemont Gardens. The above map has both routes: ours in red and theirs in blue. 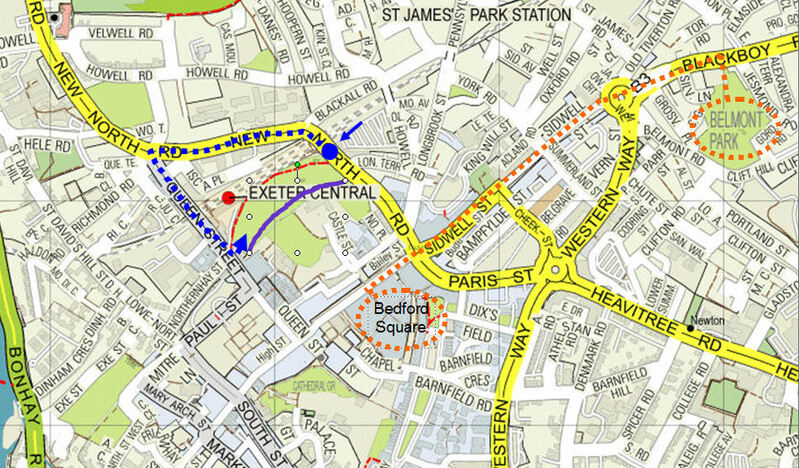 The Exeter Together route is straight through the middle of town. The EDL route looks like it is very near by and it is as the crow flies. However, New North Road is a main artery road that consists mostly of parked cars and heavy traffic and the combination of the railway and Rougemont Gardens makes an impassable obstacle between them and the High Street. Rougement Gardens is perfect for the police. There are physically 4 gated exits from Rougement Gardens – the two main ones at either end (new North Road and Queen Street) and two gated passageways (door sized) through the city wall – which can either be locked or easily blocked by the police. Even if some of them got through those, the building work on the library has meant the main footpath out past the library is blocked with a 10 foot wooden fence. That leaves physically only the gated exit by the courts that can be locked. The rest of the park is surrounded by the city wall (which is massive and marked in purple on the map), or on the other side an enormous and very steep bank through dense foliage leading down to railings which are 5 foot high (red dotted line other side of the park). Basically it is a large kettle away from the view of the public. The EDL will be assembling in the pub from 12 noon & their demo starts at 1.30pm, marching to Northernhay and Rougemont Gardens, Castle Street, EX4 3PL for their rally. Coaches & minibuses will be directed to a holding area for duration of demo. Cars are instructed to park in nearby public car parks. EDL members arriving by rail will arrive at Exeter Central Station. We anticipate 800+ on the Exeter Together demo going by the numbers who have signed their statement. There will probably be 200-300 EDL. The local support base for AFN in Exeter is tiny and the physical arrangements are such that the EDL are essentially kettled in their rally – which it will not be possible to get in to or out of. The local geography and policing arrangements will mean that once EDL supporters have got to their assembly point there will be no possibility of contact with the Exeter Together demonstration. There is a football game at 3pm at St James Park and the EDL are probably finishing in time for them to go to the football. So if there are problems it is likely to be after their rally. The Exeter EDL News website has put some information together which may be of interest. The first item demolishes the reasons given by the EDL for their demonstration: EDL justifications for Exeter demo are paper thin! This shows how they circulate fake Islamophobic stories: Reflections on Kristallnacht and the spreading of lies and hatred by the EDL. This deals with their racism: The vile racism of Exeter English Defence League.